I have yet another New York State Census for Stockton, NY done in the year 1905. Nothing of great interest here, but it does help confirm data already collected. 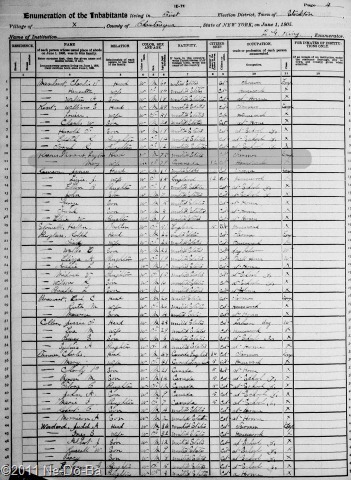 1905 New York State Census, Stockton, Chautauqua Co., NY, page 4, dated 1-Jun-1905. It is interesting to note that Mary/Marleah is once again “Indian”, but Layton is listed as white. Something prompted the census taker to see her as “Indian” but not him. Perhaps she is darker skinned then he is or she is involved in “Indian” activities while he is not. She says (or at least the census taker wrote) she has been in the U.S. for 12 years which I know is absolutely not accurate because I have been tracking her in census records in Stockton since 1875.